A new book about Alex Riel was published on September 1st 2010. It is written in Danish but is planned for translation into English at some point in the future. In “Alex Riel – manden bag trommerne” Alex relates in his own words, the many stories of his life to the writer Hans Barfod. Alex takes us on a musical journey starting with the little boy who listened in awe to Louis Armstrong whilst drumming along on a scooter helmet who grew into a young man of huge talent but also of fears and doubts, to the seasoned musician now regarded as one of the most influential European drummers of all time. However this book is not just about drumming and the love of music – it’s also about a grown man with a playful mind, someone who’s known to be an incurable prankster, car enthusiast, dog lover, teddy bear adorer and so much more. It’s a portrait of a unique person who’s impossible to categorize – except as one of the world’s best behind a drum kit. The book is filled with interesting and highly entertaining anecdotes from Alex’ life. Many of these little stories happen to include famous musicians whom Alex has worked with throughout several decades – who in their own right, are regarded as major actors in jazz history. For a more multi-faceted perspective on Alex’ life, his story is supplemented by many others about him from friends and acquaintances – musicians, actors, and journalists etc. 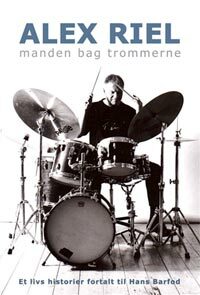 – adding interesting and often amusing dimensions to this portrait of a Danish drum legend.